Health care and business are increasingly interconnected. Whether your goal is to become a clinical practitioner or help manage anything from a hospital to a biotech company, knowing the financial incentives in each industry in tandem with the flow of money in health care is fundamental to understanding today's health care system. Those with strong medical and business knowledge will be better prepared to lead teams forward, challenge the status quo, and create an impact that goes beyond the bottom line. With Duke University's Medical Center and Research Triangle Park, both located in Durham, you’ll have access to some of the most cutting-edge research and business opportunities to both challenge and inspire you. Students typically apply to Fuqua during their second year at the School of Medicine. Indicate your interest in a dual degree upon admission to the School of Medicine. Apply here for Fuqua or review application instructions. Apply here for the School of Medicine or review the admissions process. The program was developed to keep MD/MBA graduates within the health care field and to create future physician-executives. 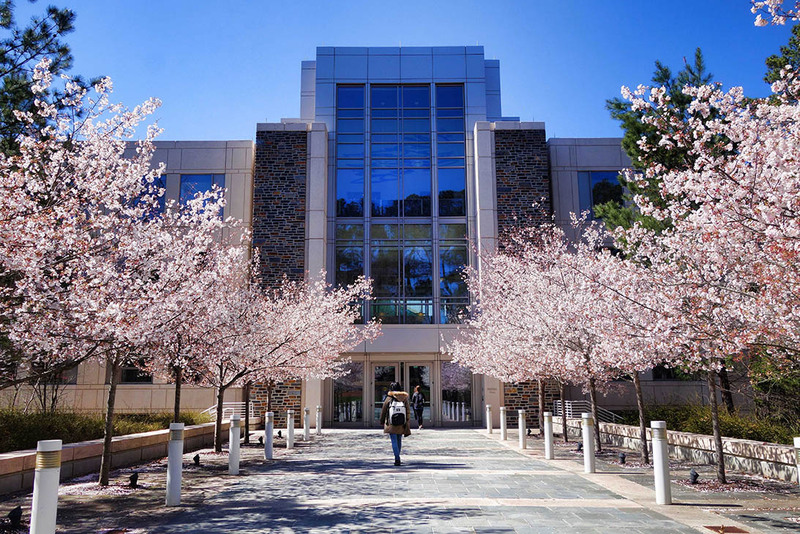 Unlike many MD/MBA degree programs, the Duke program does not require you to give up clinical practice in order to complete your business coursework. The emphasis is not on one discipline or the other, but preparing you to become a leader in both. The MD/MBA degree program also has a first-of-its-kind, MBA-like rotational residency, called Duke's Management and Leadership Pathway. Over 15–18 months, you get rigorous clinical exposure along with mentorship and rotational opportunities in management to develop critical leadership skills in all facets of medicine, including care delivery, research, and education. Focus on the entire health care ecosystem and gain a deeper appreciation of the dynamics between policymakers, providers, insurers, device manufacturers, health information systems, and bio-pharmaceutical companies. You’ll master a spectrum of skills that will enable you to effect change for the better. Created in 1999, the program now ranks among the top health industry business school concentrations in the world. In addition to HSM, you will have the option to complete one additional concentration or certificate at Fuqua. The Medical School's courses are usually held on a Monday/Wednesday or Tuesday/Thursday schedule. The Medical School and Fuqua follow different academic calendars and semester schedules. Fuqua semesters are divided into two terms each. When scheduling a semester-long Medical School course, be sure to consider both of Fuqua's terms so that there will not be a conflict. The first 2 years of tuition are paid to the School of Medicine. The next 3 years of tuition (seven semesters) are a blended rate, split between Fuqua and the School of Medicine. Financial aid will be processed through the School of Medicine. Explore the School of Medicine's merit-based scholarships. Learn about the School of Medicine's student loan programs. As an MD/MBA student, you have the full spectrum of both medical and business careers available to you. Those who choose not to practice medicine often go on to careers in consulting, banking, life sciences, administration, or policy. Those who opt to begin their post-graduation careers in business can take advantage of on-campus interviewing and recruiting options through Fuqua's Career Management Center (CMC), while those who intend to practice medicine can find a residency with the help of the School of Medicine's Match program. The MLP-R is geared toward helping residents complete their requirements for clinical practice and ABMS board eligibility (and where applicable, specialty board certification). It also lets residents participate in project-driven modules designed to solve problems within their clinical Department and Duke Medicine. Throughout the combined training program, clinical rotations and management modules are aligned. For example, a trainee may participate in a clinical rotation in nephrology and then complete a management rotation aimed at increasing outpatient dialysis services. See why one Duke medical student chose to also pursue his MBA and how he feels both degrees will help him in his future career.